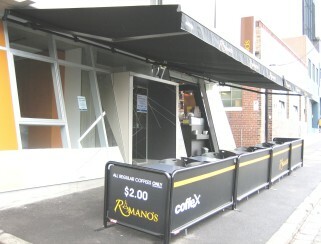 Permashield™’s Folding Arm Awnings offer excellent protection against the sun, wind and rain. These high-quality retractable awnings can be adapted to any size you require, and can span to a virtually unlimited range of width. Our commercial shade systems are ideal for any type of business premises. These highly adaptable shading systems are the perfect solution to glare, shading problems, and exposed areas. We offer the latest aesthetic designs and a comprehensive range of services to assist with your needs. Our commercial shade systems are typically used in retail environments for managing problem areas affected by strong seasonal sun, and/or element exposure. If you’re looking for quality retractable awnings and shading systems nationwide, The Australian Trellis Door Co can help you. Find your local contact information and talk to a local ATDC professional in your area. We guarantee expert help and friendly services! For more information about our commercial shading systems or to speak to one of our experts, call The Australian Trellis Door Co or contact us online. We’ll be happy to provide any information, advice, and practical support you need.